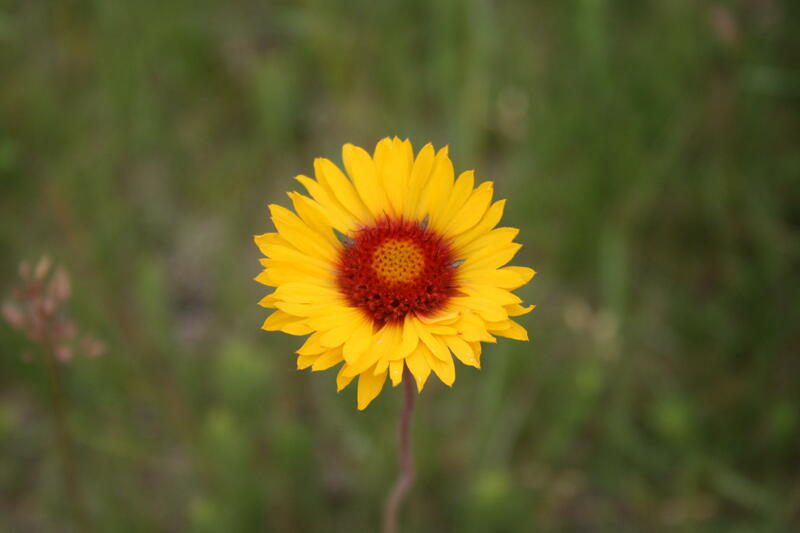 What you and I know as blanketflower or gaillardia was unknown to science when Meriwether Lewis collected a specimen near what is now known as Lewis and Clark Pass in Montana, July 6, 1806. It was later described by Frederick Pursh and named Gaillardia aristata after French botanist Gaillard de Marentonneau. Blanketflower or gaillardia are the most commonly used names for this plant today, but it is also known as brown-eyed Susan because the flowers are said to resemble those of black-eyed Susan, but red-eyed Susan would be more accurate. Blanketflower is a perennial member of the aster family that ranges over much of western North America and is the only Gaillardia native to North Dakota. It may be found across the state on upland prairie, railroad rights-of-ways, and similar sites flowering in June and July. It is perhaps most often observed on well drained soils, and as you would expect, is drought tolerant. I suspect that many of you are also familiar with blanketflower as an ornamental. It makes an excellent addition to a flower garden or rock garden. It is also increasingly used in xeriscaping, or landscaping designed for minimal or no watering. Plus, it is gaining in popularity as a common wildflower seed in the seeding mixtures used in prairie restoration. I have seen some impressive photographs of prairie restoration efforts ablaze with blanketflower’s in bloom. It should come as no surprise that over two dozen varieties and hybrids of this species have now been developed. So be on the lookout for blanketflower as you travel about. And you might even want to consider adding it to your garden next year.